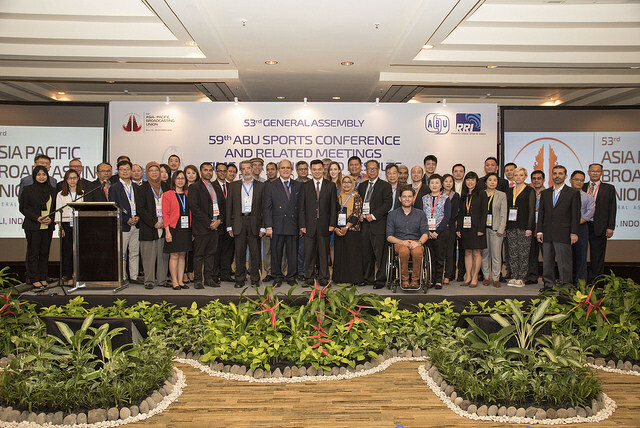 The ABU Sports Group Conference and related meetings (October 18 - 20, 2016) this year ended on a high note in Bali, Indonesia. The conference saw the launch of the ABU Sports Network or ASN. The ASN started off with ten registered members as of now. The Secretary General of ABU, Dr Javad Mottaghi said the initiative is part of the Union’s strategies to exploit the potential of technology and new media in the interest of the members. In today’s world Dr Javad said, a digital strategy is a must have component of any organisation, especially the broadcast. The Chairman of the Sports Group, Mr Jiang Heping of CCTV said the success of the ABU Sports Network depends on the participation of members. He said it is one of the major achievements of ABU Sports and urged members to be part of it. According to the ABU Sports Director, the platform will help to enhance and make available diverse and varied content for sports programming. It will start with sharing and distributing right free sports and entertainment news clips, he said. The Conference also elected three new members to the Finance Committee. TVB Hong Kong, VTV Vietnam, and ATN Afghanistan will serve for two years, effective October 2016. The three replaces KBS Korea, CCTV China and RTM Malaysia after their term ended in May 2016. The conference saw several members sharing their experiences ranging from Rio Olympics to sports broadcasting in their respective countries. Presentations at the “member’s forum” were made by MNB Mongolia, TVB Hong Kong, and the Attitude Group from New Zealand. A paralympian, Mr. Dan Bukingham shared his personal experiences on Rio Paralympic production and highlighted the importance to promote paralympic in Asia and the Pacific. Dan Buckingham won a gold medal in wheelchair rugby at the Athens 2004 Paralympics. The presentation on the status and preparation towards the 18th Asian Games Jakarta Palembang 2018 by the Vice Deputy II Games Administration of the Indonesia Asian Games Organising Committee, INASGOC was another highlight. The INASGOC informed the conference that the presidential decree and the instruction on the Asian Games has been issued. The presentation talked about the games master plan, including construction and renovation of competition and non competition venues to the city infrastructure. The conference was also informed of Test Events to Sport and Discipline, Proposed Schedules and Venues. The Bali ABU General Assembly ended on with a World Broadcasting Union or WBU Conference on October 26, 2016. The next sports group conference and related meetings will take place in May 2017.